This week's stove is the Caldera Cone with 10-12 alcohol burner from Trail Designs. The Caldera Cone with 10-12 burner is a stable, efficient, and wind resistant ultralight alcohol system that packs well inside a standard Ziploc container that doubles as a bowl. Believe it or not, everything in the second photo is also present in the first. I've written a review which is now available on Seattle Backpackers Magazine and there's a supplemental post with further information on my blog. Both can be accessed via this link. I just added some more photos and a technical appendix listing weights to the blog post. How much alcohol do I need to burn (by weight) to boil 2 cups of water? HH8 wrote: How much alcohol do I need to burn (by weight) to boil 2 cups of water? By weight? Haven't got a clue. I usually use just over half a fluid ounce of denatured alcohol to boil two cups of cold water. 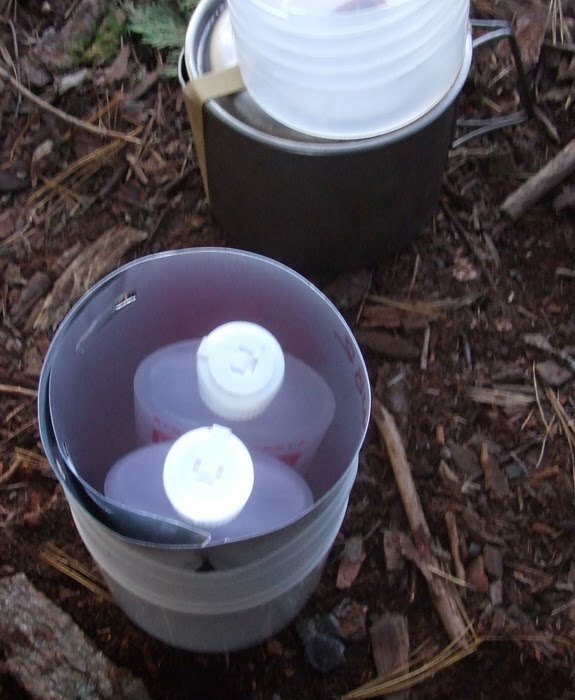 I carry a small medicine measuring cup (like from cough syrup) that I use to mete out the alcohol, but I don't have any way to check weight out on the trail. If you're really interested, you could measure out a smidge more than half a fluid ounce and weigh the alcohol at home. I used an ordinary 8oz "bottled water" bottle to hold my alcohol; you can see it in the photos. The problem with using a drink bottle of course is that someone might unknowingly take a drink. The two flattened type bottles fit in together, but it's unlikely that anyone would confuse them with drink bottles. You'd have capacity and safety at the same time.